In the past few years, it's observed that cellular operators have experienced a fast growth of mobile broadband subscribers and traffic volume per subscriber. Simultaneously, operators are moving from a single to a multi-service offering by adding new services. This chapter presents a survey of the Quality of Service (QoS) drivers in LTE and LTE-Advanced, focusing on IP Frameworks and IP Services. It also includes a detailed list and description of the resource management mechanisms, such as power saving, admission control, scheduling and resource allocation that play a vital role in QoS. The authors describe the State-of-the-Art in IP frameworks and Services such as video, VoIP, Video on Demand (VoD). Also, resource management mechanisms are described such as Energy efficiency, admission control, and scheduling. 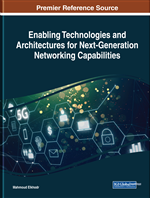 In the end, the authors mentioned the future directions about QoS in 5G networks. Radio mobile technology has turned into very significant in electronic market of the last years. Due to the services they can deliver to end user, user terminals, such as tablets, smart phones and laptops, are now very familiar in our society. In fact, they can be used for many services e.g. voice call, as well as social networking activities. Long Term Evolution (LTE) deliver these services with very high performance, especially in terms of data rate and latency: a speed of 300 Mbit/s per user is expected. Since LTE was the first full IP wireless technology standardized by 3rd Generation Partnership Project (3GPP), it has a robust relationship with applications based on data transfers. LTE is a technology based on OFDM and it uses a flat network architecture without Radio Network Controller (RNC) offering low transmission and control delay. The main benefits of LTE technology are that it offers high speed Internet, support a large number of simultaneous users and offer services in real time. These are the reasons why until July 2016, 170 countries and regions in the world opened 521 LTE networks. LTE-Advanced was introduced in 3GPP Release 10. Beginning the Evolution of LTE, LTE-Advanced includes all the features of Release 8 and 9 and new features for enhanced performance. The most significant features are Carrier Aggregation (CA), improved support for heterogeneous deployments, enhanced multi-antenna support and relaying. It should be noted that, most of the LTE-Advanced features can be introduced into the network as simple software upgrades. CA was proposed by 3GPP in order to satisfy the design of LTE-Advanced system with the maximum bandwidth and to maintain the backward compatibility. Coordinated Multi-Point (CoMP) is a distributed antenna technology which can improve system capacity and coverage through the coordination of neighbouring Base Stations (BSs). Moreover, enhanced Inter-Cell Interference Coordination (eICIC) technology is used which is the vertical interference suppression of heterogeneous networks between different layers. In order to reduce network cost, support flexible deployment, improve the network capacity and expand the coverage, in LTE-Advanced included a Relay technique. In October 2009, the 3GPP Partners formally submitted LTE-Advanced to the ITU Radio communication sector (ITU-R) as a candidate for 4G IMT-Advanced. Publication by the ITU of the specification for IMT-Advanced was finalized on March 2011. In Release-12 the first mission critical service defined (“Push to talk”) and isolated E-UTRAN operation for Public Safety. Enhancements to proximity-based services such as User Equipment to Network Relay added and proposed enhancements to discover and direct communication. Furthermore, this Release supports efficient, dynamically geographically distributed transmission in LTE through single-cell point-to-multipoint transmission. The recent increase of mobile data usage and emergence of new applications as MMOG (Multimedia Online Gaming), mobile TV, Web 2.0, streaming contents have forced the 3rd Generation Partnership Project (3GPP) to work towards the LTE. The project began in November 2004 and determines the long-term evolution of Universal Mobile Telecommunications System (UMTS) of 3GPP. LTE is the evolution of UMTS, therefore called Evolved UTRA (E-UTRA) and Evolved UTRAN (E-UTRAN). However, there is a parallel project called 3GPP System Architecture Evolution (SAE), which requires a new IP Core Network (CN) known as the Evolved Packet Core (EPC). The combination of EPC and the evolved RAN (E UTRA, E-UTRAN) is the Evolved Packet System (EPS). The LTE has performance requirements based on the technologies of the physical layer as the Orthogonal Frequency Division Multiplexing (OFDM) and Multiple Input-Multiple Output (MIMO).